This statement is in condemnation of the judicial harassment being meted out to senior Assamese Editor Mr. Manjit Mahanta, Sahitya Academy Awardee writer Hiren Gohain and farmers' leader Akhil Gogoi in a case of Sedition slapped upon them for participation in a peaceful protest against the Citizenship (Amendment) Bill in Guwahati. 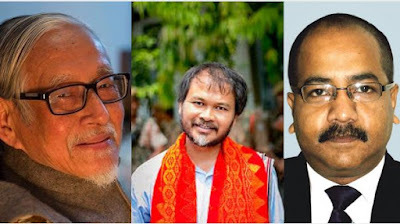 On January 9, 2019, Latasil police registered a case against one of Assam's prominent scholar and intellectual Hiren Gohain, Akhil Gogoi, President of the Krishak Mukti Sangram Samiti (KMSS) and Manjit Mahanta, Convenor of the Forum against Citizenship Act Amendment Bill, under Sections 120(B) (“punishment of criminal conspiracy”), 121 (“waging or attempting to wage war, or abetting waging of war, against the Government”), 123 (“concealing with intent to facilitate design to wage war”), and 124(A) (“sedition”) of the Indian Penal Code. On January 11, 2019, the Guwahati High Court granted bail to Mr. Manjit Mahanta and interim bail to Hiren Gohain and Akhil Gogoi against a surety of Rs. 5,000 each and fixed January 22, 2019 as the next date of hearing of the case. The case was filed after Hiren Gohain, Akhil Gogoi and Manjit Mahanta attended a public rally organized by the Forum against Citizenship Act Amendment Bill in Latasil, Guwahati, on January 7, 2019, during which they expressed their views against the religion-based Citizenship (Amendment) Bill, 2016 and strongly opposed the passing of this piece of legislation. Despite their opposition to the Bill, the three human rights defenders have publicly stated that they are not against the Constitution of India, and are solely asking for equal constitutional protection for the people of Assam State. CAAJ is deeply concerned with the colonial era sedition law being imposed arbitrarily by the state upon anyone who dissents. In this case Mr, Mahanti is a senior TV journalist and Editor and Mr. Gohain has been awarded by the Academy of Letters for his intellectual contributions. Both are towering figures in their respective fields. Caaj demands immediate removal of sedition charges upon all of them and restore the democratic right to dissent and freedom of expression in the state.